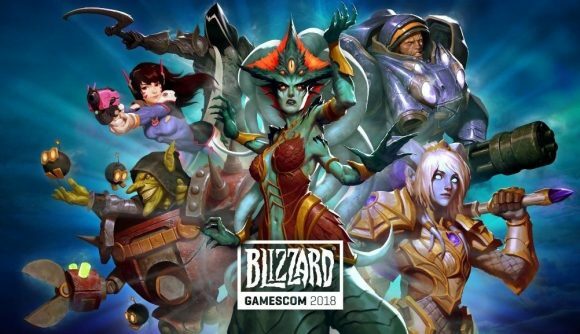 Blizzard has announced its schedule of events for Gamescom, the massive European games expo held each year in Cologne, Germany. As you might have expected, the company has presentations ready for each of its tentpole franchises, and they’ll all be going down on the main stage on Wednesday, August 22. The schedule was first published through the Blizzard at Gamescom app, which offers expo-goers an augmented reality guided tour through the Blizzard booth at Gamescom. If you’re attending Gamescom, you can use the app to scan various displays and items in the Blizzard area, and earn a chance to win in-game loot. Obviously, what you’ll want to watch depends on which Blizzard games you’re interested in, but there are a couple items worth highlighting here: First, Blizzard has said they’ll be unveiling new Overwatch content at Gamescom, and that’ll likely be during the stage presentation Wednesday. Second, Blizzard has “several” Diablo-related projects in the pipeline, as community manager Brandy Camel explained in this announcement. One of those announcements is very likely Diablo III launching on the Nintendo Switch, news that Forbes leaked earlier this week. If a new Diablo game is coming, Blizzard may wait until BlizzCon to announce it – but it’ll be worth tuning into their Gamescom presentation to see what else they may have in store all the same. If you’re not attending Gamescom, you can watch proceedings via Blizzard’s channels on YouTube and Twitch. The company has also set up an event website for Gamescom, which will host livestreams from the event. Blizzard will run a “Blizzard at Gamescom” show each day of the expo, hosted by actor and former IGN host Naomi Kyle and YouTuber Mark “Turps” Turpin. That will start at 17:00 Monday through Friday, and 16:00 Saturday. Of course, we’ll be covering the event in depth here, too – so stay tuned for all the latest from the show floor in Cologne.